-Socket Base Adaptor for GU10 to E26 Standard Medium Base. -For customers who want to switch from GU10 based bulbs to E26 based bulbs without having to change the light fixture. 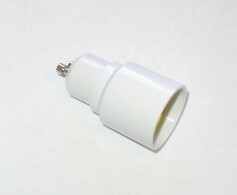 This enables them to use a larger bulb if brighter is needed. For example you can change your 35watt GU10 equivalent to a E26 based PAR30 with a 100 Watt Equivalent and have your space brighter.